Bhubaneswar: The trailer of the much-awaited live-action Disney movie- Aladdin has been launched on Monday. The movie is set to release on May 24. Growing up in the 90s meant some amazing Disney movies, and Aladdin is on top of that list. The opening music will take you back the memories of the original 1992 animated hit of the same name. 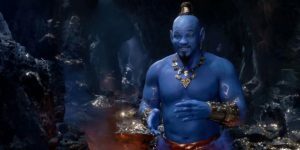 And helping us fight the Monday blues is the bluest blue Genie played by Will Smith. He has promised to bring a ‘hip hop’ flavor to his reprisal of Genie. Navid Negahban will be playing the Sultan with Billy Magnussen as a new character called Prince Anders. Frank Welker will reprise his role as the voice actor for Abu, Aladdin’s mischievous pet monkey, as well as the voice of the Cave of Wonders. It is not yet known who will be giving voice to Iago, Jafar’s parrot. Original songs from the 1992 film will be remade, along with some new music from composer Alan Menken.